There's no teen spirit to be found here, although a big win could certainly propel you into a higher state of consciousness. 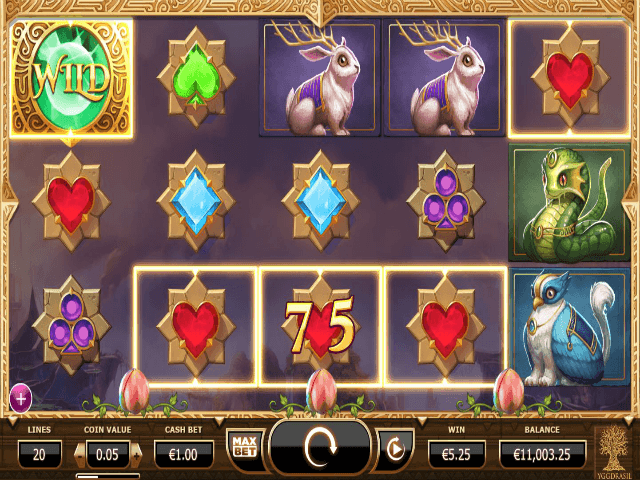 In this fantasy-themed Nirvana online slot from Yggdrasil (itself a mythical tree, interestingly enough) you'll join dragons, phoenixes, cats, and rabbits with antlers. Yes, that’s right, antlers. There are five reels over 20 paylines to test your skills and luck, and this video slot also has a bonus round which can seriously ramp up your winnings. If you simply can’t resist the idea of lining your pockets with the impressive bonus features, or just like the idea of rabbits with antlers, then read on. Play Nirvana for Real Money! As you'd expect from a well-established software provider like Yggdrasil, this game looks and sounds great. The music is lush and atmospheric, really pulling you into the fantastical backdrop of mountains and clouds. Yet visually, it's actually simpler than you might expect. There are no garish characters, just high definition, clear symbols and reels. The gold and stone theme works well with the interface – everything you need to know is on clear, contrasting black boxes, so you can see your lines and bet info at a glance. It's worth noting that although they may be slightly bizarre in nature, the creatures are very nicely drawn, too. 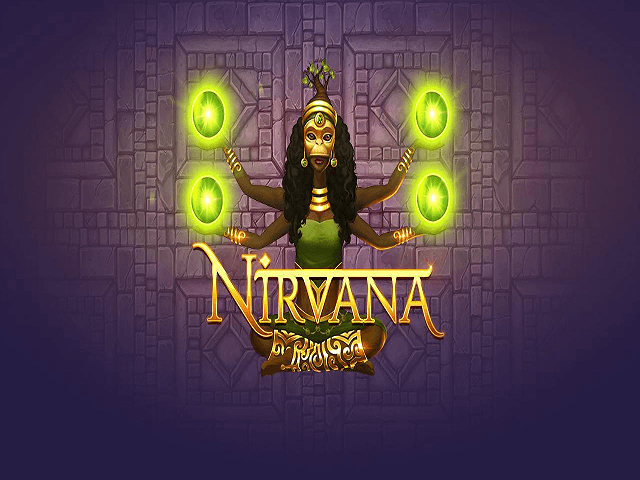 If you enjoy a visual treat while racking up wins, then the Nirvana slot could well be your paradise. As you might have guessed, the strange mythological animals are the highest value symbols, so these are the ones you want to match for the best standard payouts. The standard jackpot is 250 coins, but you can get this much higher with the bonus feature, which we'll cover later. Bet-wise, you can set your stakes from 0.40 coins right up to 100, if you're feeling like lady luck is looking over your shoulder. If you're still testing the waters of online slots, then you might not feel comfortable with the higher stakes, but thankfully the risk is balanced by the bonus potential. In addition to the wild (which is a green 'Wild' symbol), and the scatter (a lotus flower), there's a bonus free spin feature. This is where you can really stack up on winnings if things go your way. If you can land two scatters, you'll get a free spin and a random feature. If you get three scatters, then you'll get ten free spins. Also, you can choose one of three bonuses: A wild seed, which adds two to four wilds on every spin, a mega reel, which transforms the last three reels into one giant symbol, and nudge reels, which nudge one reel up or down if you're close to a better win than you've already spun. 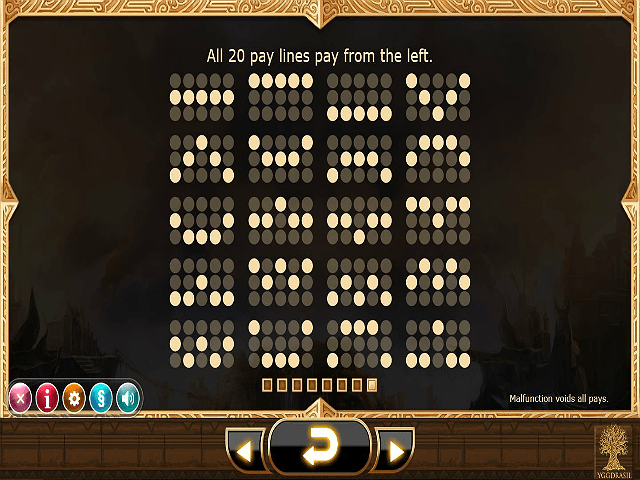 The last bonus feature, the nudge, is especially good – how many times have you finished one symbol off a massive payout? What's even better is that if you get additional scatters in the free spin mode, you'll also get spin resets and extra bonus features. Overall this is a slick, fun, and rewarding slot to play. 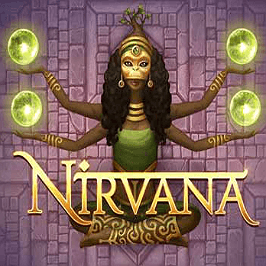 Share this Nirvana Review today! 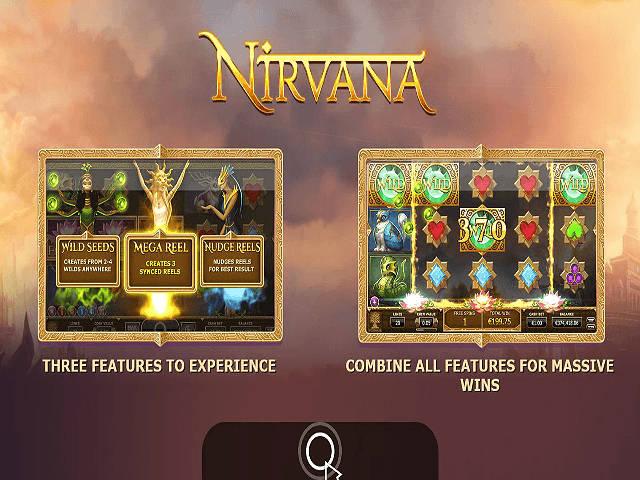 If you like Nirvana, you'll love these slot titles too!